Fond is looking for a part time cook, Must be available Saturdays and Sundays. 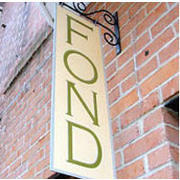 Looking for a strong, organized and driven cook to become a part of our small and dedicated team at Fond. Person must be organized, willig to follow directions and have attention to detail. We are looking for someone to join our small but very dedicated team.